When I think of refreshing summer desserts, I think of floats! I remember my first experience with root beer floats at a childhood birthday party and I have been hooked ever since. 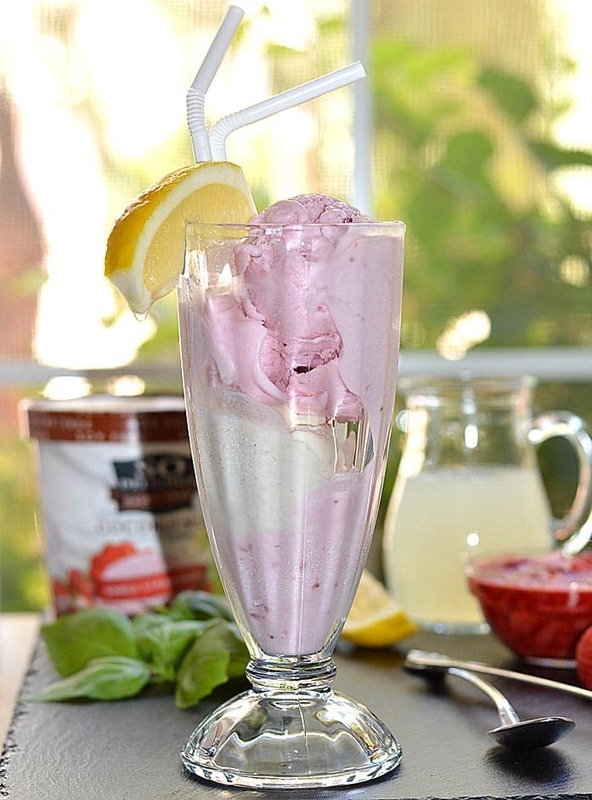 Today I’ll be showing you how to make this So Delicious Dairy Free Strawberry Lemonade Float that is full of flavor. 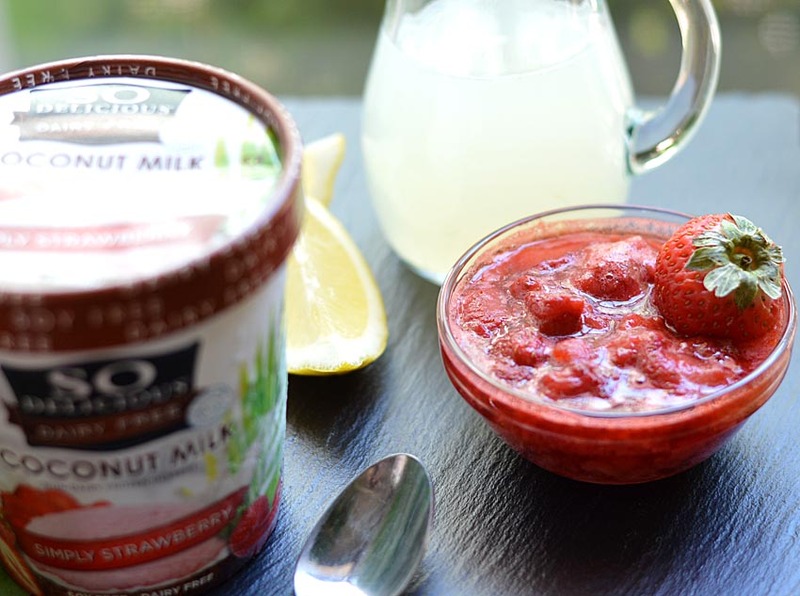 For this recipe, I chose the So Delicious Dairy Free® Simply Strawberry Coconut Milk and the Vanilla Almond Milk flavors of their frozen dessert. I found them both at my local Scottsdale, AZ Walmart in the Ice Cream aisle. 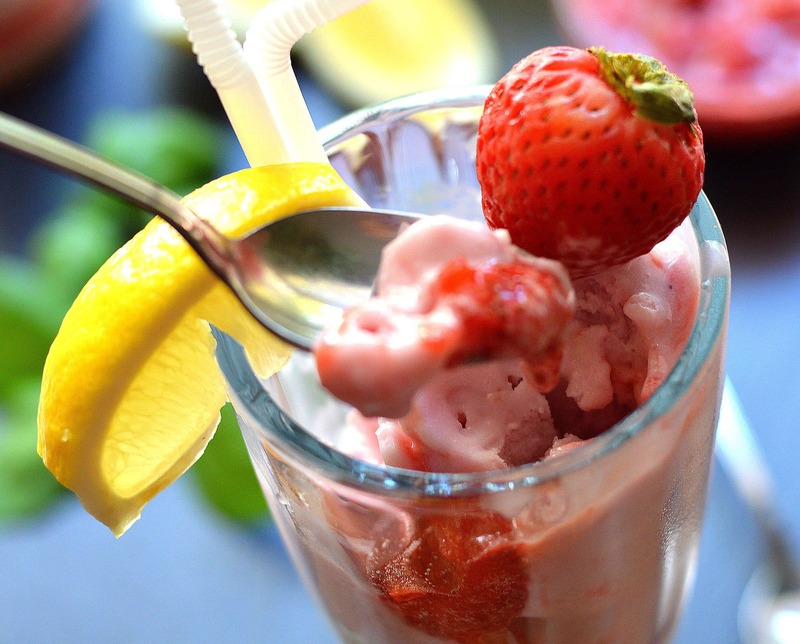 What makes this float special is the homemade strawberry sauce. It’s simply fresh (or frozen) strawberries and sugar boiled down until the strawberries are tender. I left mine a little chunky because that’s how I like them, but you could also opt to puree and strain this sauce as well. Be sure to allow this to cool or it will melt your float! The other component is a light lemonade that we’ll be adding just before serving. A few final tips for the perfect float! I like to garnish with a fresh lemon so my guests can add more lemon-y flavor if they desire. It also lets your guests know what’s in the float. Another good tip? Freeze the glasses before filling them so the float stays frozen longer. I also like to provide both spoons (for enjoying while still semi-frozen) and straws (for enjoying as it melts). 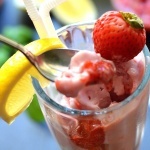 I really loved the balance of flavors in this So Delicious Dairy Free Strawberry Lemonade Float and I think you will too! But wait, have you seen this? A post by me for So Delicious Dairy Free® would not be complete without a mention of my current obsession. 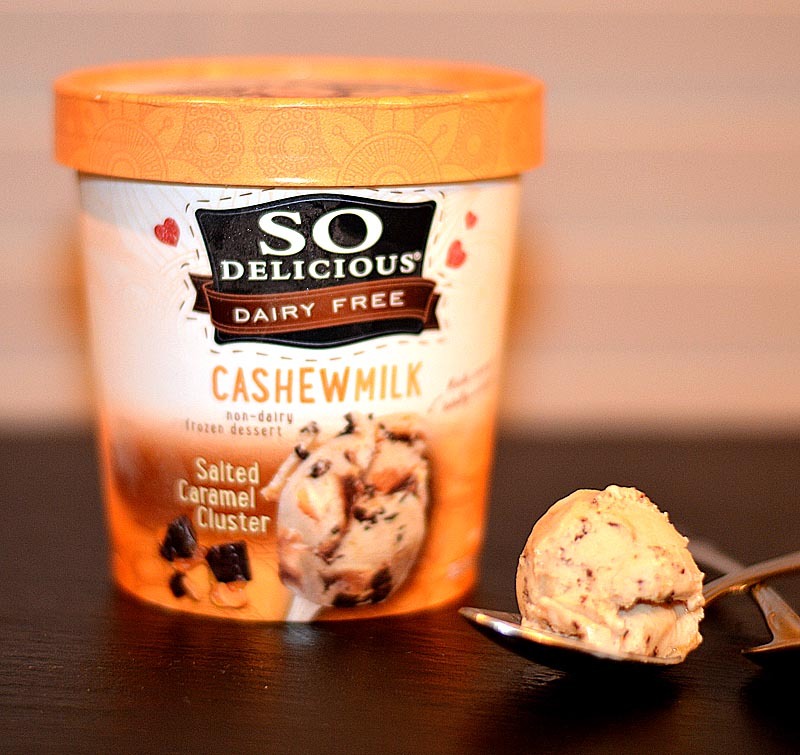 Actually, it has been an ongoing obsession since So Delicious released this Cashew Milk Salted Caramel Cluster. You are, at this point, probably sick of me going on and on about the Salted Caramel Cluster frozen dessert, but have you tried it yet? THIS stuff is, in my opinion, vegan perfection! 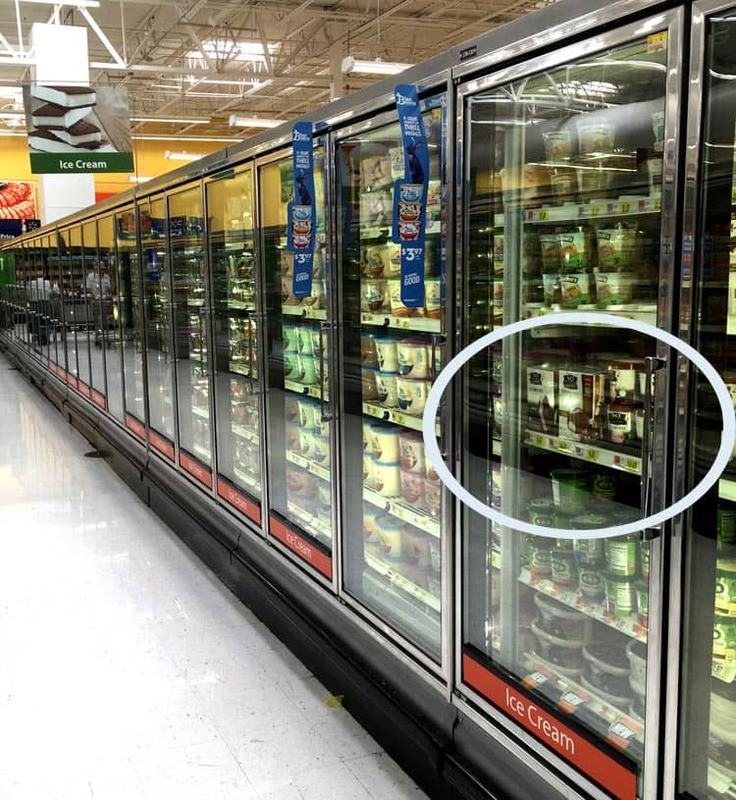 If you are unfamiliar with So Delicious Dairy Free®, here are few points to consider. Their products are plant-based, dairy-free and egg-free. They are certified Kosher AND Vegan, as well as Non-GMO Project Verified. Lastly, their desserts are cholesterol-free and contain NO high-fructose corn syrup, artificial colors, flavors or preservatives. 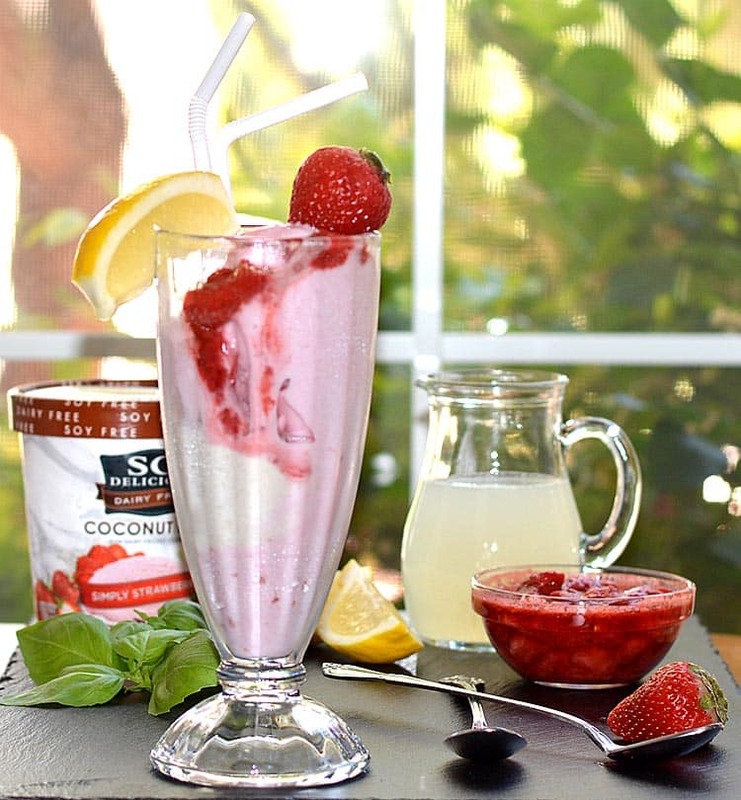 If you try this recipe for my So Delicious Dairy Free® Strawberry Lemonade Float, leave a comment and let me know what you thought! In a saucepan, add the strawberry slices and sugar. 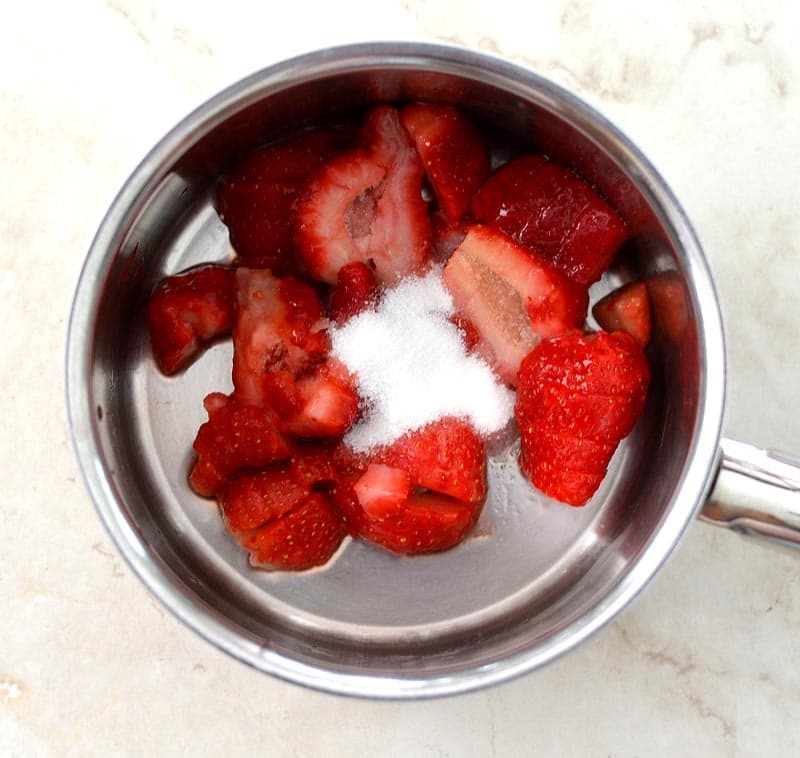 Allow to boil until the strawberries are very soft. I left mine with some texture, but you could choose to puree & strain the sauce if you'd prefer. Place alternating scoops of Simply Strawberry & Vanilla until your float glass is very full (it will melt down a bit after adding the lemonade). Add the strawberry sauce and lemonade just before serving. Serve with both spoons and straws. Garnish each glass with a sprig of fresh mint if desired.